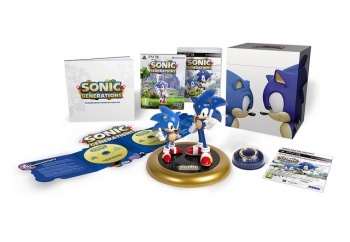 Sega has revealed the Sonic Generations collector's edition and it's all kind of nice. It's also exclusive to Europe and Australia. Like a long line of Sonic games before it, Sonic Generations is promising to be the title that returns the oddly hued hedgehog to his rightful place at the top of the platforming mascot heap. It's also being framed as a love letter to long term Sonic fans, miserable as they may be, and, like any good declaration of love, it comes with a ring. And a statuette. Wow, that metaphor went somewhere really weird, didn't it? A statuette, featuring the two genus of hedgehog that appear in the game. The squat, finger-wagging Sonic of yore (Squatus Classicus), and the taller, slimmer, and vastly more aggravating Sonic of recent years (Obnoxious 'tude Maximus). A commemorative "Gold Ring," which, if there is any justice in this world, will come with a tiny pamphlet that explains, in strictly legal terms, that the ring will not save your life should you accidentally impale yourself on a spike. The 20th Anniversary Sonic soundtrack, which had better feature the Chemical Plant Zone theme or there will be violence. The History of Sonic: the Birth of an Icon documentary. Bonus downloadable content for the game itself. It all comes packed in a fancy lenticular box that changes the cover art depending on what angle you're looking at it from. It'll be released alongside the regular plebeian edition of the game on November 2011 for Xbox 360 and PlayStation 3. Oh deary me, look at the time. It's almost import O'clock.